No doubt about it. Portrait painting is an utterly thankless task. William Dobell found this out the hard way when his controversial painting of artist Joshua Smith won Australia’s foremost portrait prize, the Archibald, in 1943. The decision caused two Royal Art Society members, Joshua Wolinski and Mary Edwards, to take legal action against Dobell and the Art Gallery of New South Wales’ Trustees, alleging that the painting was a ‘distorted and caricatured form’ and should not have qualified as a ‘portrait’. Dobell declared that his approach was not to “copy” something, but “to create something”. He declared: “To me, a sincere artist is not one who makes a faithful attempt to put on canvas what is in front of him, but one who tries to create something which is living in itself, regardless of its subject. So long as people expect paintings to be simply coloured photographs they get no individuality and in the case of portraits, no characterisation.” Photography initiated a revolution in the visual arts. With the rise of a technology that meant a true physical likeness could be captured and preserved for time immemorial, it opened the playing field for visual artists who could play around with physical representation and look beyond and beneath a subject’s surface. Speaking of ‘distortion’, what does any of this mean for the larger-than-life-size official portrait of the Duchess of Cambridge unveiled at the National Portrait Gallery in London? Well, there’s certainly nothing controversial about the method or approach the artist has taken. Hell, the first thing that sprang to mind as a point of comparison is the nauseatingly saccharine portrait of myself at the age of 14 with my younger sister drawn in St Mark’s Square in Venice by a pavement artist. A charcoal sketch that I would like to make clear is currently rolled up in a tube in my father’s wardrobe. It is not framed. Or hanging in public. Nor shall it ever be. We just keep it for laughs. What of the depiction of Catherine? 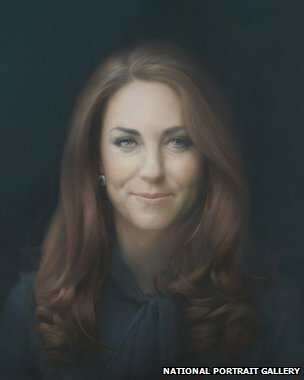 The Duchess declared the portrait to be “just amazing”. Damned by faint praise, perhaps? Maybe they decided to commission a portrait that would last for a couple of decades. Catherine at the age of 50. Won’t need updating anytime soon, anyway.